Welcome to The Sustainable MBA Blog! 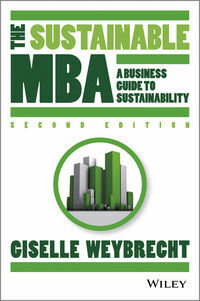 “The Sustainable MBA: The Business Guide to Sustainability” is a book for anyone interested in what the business sector can and is doing in sustainability. It is a practical guide with lots of tips on how to get involved and how to really bring these ideas into your job, whatever job that might be. This blog is a space for me to share some of my thoughts, in bite sized pieces, about sustainability and business. As you can see I haven’t updated this blog for some time now. I will be bringing it back to live very soon so stay tuned. Many teachers, from high school all the way to executive education, use these blogs as conversation starters in the classroom. Please feel free to share, comment, agree or disagree or suggest your own. For more information about the book and my other projects please visit www.project-insideout.com. Instead of a full degree course, it might be to add sustainability as a capstone subject in MBA. I would like to know more about this book. May be I introduce as a Corporate Training course material as I am Director Executive Development Program for the OYA Graduate Business School, University of North Malaysia.